it’s really no wonder why you see so many chain link fences in the Twin Cities. Whether you’re looking to protect your property, increase property value, or define property lines, a chain link fence could be the perfect option for your residential or commercial fencing needs. Available in both galvanized steel and color coating, chain link fences can be customized for any residential or commercial need, blending in with their surroundings and providing your property with a protective barrier. 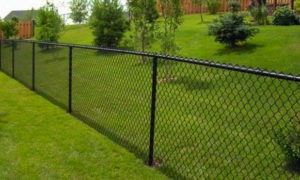 With a chain link fence, you’ll have the benefit of a uniquely protective and unobtrusive fencing system, often used for tennis courts, school boundaries, airport runways, baseball fields, and countless other commercial and residential fencing needs. All of our chain link fencing systems, including PVC coated color chain link fences, are made from galvanized steel, the perfect material for durability and strength – two things that are necessary when protecting your property. In addition to the durability of the material itself, our galvanized chain link fences are hot-dipped in a zinc coating that is proven to provide a layer of protection against corrosive agents. As a time-tested protectant against weathering and corrosion, zinc has been used for more than 200 years, and it still remains a highly reliable form of protection that’s meant to last several years. Our galvanized fencing systems are also made affordable because we install fencing systems with fittings and fixtures made from die-cast aluminum, a low-maintenance and rugged material. These aluminum fittings include, the fencing ties that attach the chain link fabric to the fencing framework, caps, rail ends, and eye tops, ensuring that the chain link fences we install are both durable and affordable. Colored chain link fences can be a very simple way for homeowners and commercial property owners to accent their property while outlining and defining their property lines. With a variety of color options available, you’ll find chain link fences that blend into their environment or stand out to create contrast, creating a unique aesthetic no matter what you choose. Colored chain link fence systems also have the added benefit of having a dual layer of protection against corrosion, providing a longer-lasting fencing system than many properties can boast. With zinc-coated galvanized steel framework specifically designed to prevent metal corrosion, colored chain link fences are fully protected from weather damage with an additional extruded polyvinyl chloride (PVC) coating. With the promise of double layer protection, when we install a colored chain link fence, we know that it will last for years and years before it begins to break down, which means that you’ll have quite a while to be satisfied with your fencing system before you even have to think about making repairs. Durable, low-maintenance fencing – Galvanized steel chain link fences require very little maintenance, if any, because the treatment process of galvanized steel provides a layer of protection from rusting and weathering. If you choose to install a colored chain link fence, the added layer of vinyl coating will provide a dual layer of protection, helping your fence last even longer than a standard galvanized steel fence. Affordable fencing system – Chain link fences are the most affordable fencing systems, which is part of the reason that you see so many. Between the longevity of these fences and the low cost of installation, there simply isn’t a more affordable fencing option that will last as long as a galvanized chain link fence. Custom color options – Most chain link fences you see may be standard galvanized steel fencing systems, but if you choose to invest in the added layer of PVC protection, you’ll have the added benefit of a color-coated chain link fence, typically with the choice of black, green, or brown. Security – Whether you’re keeping your pets and children at home with a small fence, or you’re trying to keep trespassers out with a taller fence that’s difficult to climb, a chain link fence of your specified height and weight will fit the bill. Privacy – Although chain link fences do not create a line of privacy themselves, with decorative polyethylene slats that are tinted to match your chain link fence, you can create a more private fencing system. 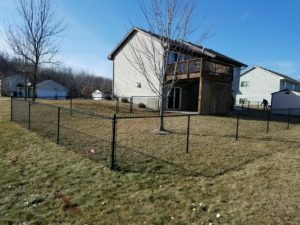 Look to Twin Cities Fence for a fencing installation contractor that will help keep your Twin Cities property safe with an affordable chain link fencing system. Contact us today at 612-443-1948, or email contact@tcfmn.com.